Claim Your Ticket To One of the Most Significant Events in Civil War History! At first glance this 1862 50-Cent Western and Atlantic Railroad Note certainly looks like a valuable Civil War collectible. The notes were issued by the railroad to make change and were carried on its trains. But look more closely. The note was issued on March 15th, 1862-barely four weeks before one of the most significant events of the Civil War-and could have actually been present when it occurred. On April 12th, 1862, volunteers of the U.S. Army led by James Andrews penetrated deep into Georgia and kidnapped one of the railroad's prized locomotives, The General, and took it on a chase across the South, attempting to destroy rolling stock, bridges, switches and telegraph lines. They raced north from Atlanta and were chased by Confederates on another train until they were finally captured just south of Chattanooga. Many of the men were tried and hanged, and many of the raiders were awarded the very first Medals of Honor for their heroic deeds. These "Railroad Notes" were issued to meet a demand for circulating money. When the Civil War hit, money became scarce in the South – especially loose change, which was being hoarded by those afraid to give away their precious metals. 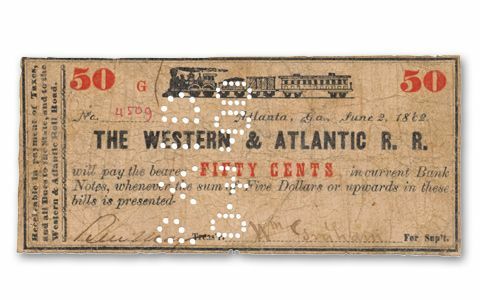 To make up for this shortage, the State of Georgia authorized up to $200,000 worth of “change bills” from the Western & Atlantic Railroad of Atlanta, Georgia. Now you can capture some of the excitement of this spectacular raid by owning this 50-cent note which could have actually been on The General during the raid! The notes are even more scarce than other Confederate issues because unlike the others, they were redeemed by the State of Georgia in 1872 and most were destroyed. Don't miss your chance to grab this genuine piece of Civil War history!